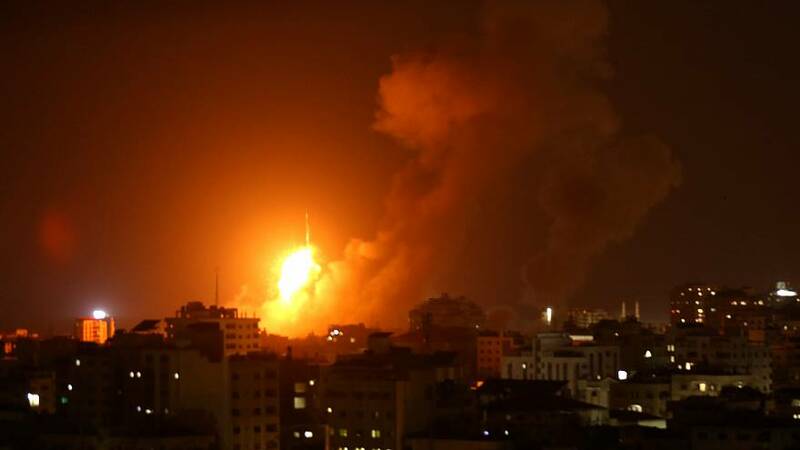 The Israeli defence forces responded with air strikes on Wednesday night after Gaza militants fired rockets into the country. There are unconfirmed reports from Gaza that a 23-year-old mother and 18-month-old daughter were killed. The Israeli army said the violence started with militants shooting at one of their engineering vehicles and it escalated from there. Palestinians fired at least 36 rockets over the border and Israel claims to have struck a dozen militant targets. Some of the rockets fired from Gaza were reported to have been intercepted by Israel's Iron Dome defence system. Israel said one Israeli was hurt by the rockets. Palestinian health officials said five civilians were wounded although the targets hit by the air strikes had been evacuated. The continued fighting comes as Egypt attempts to broker a broad cease-fire deal between Israel and Hamas and avert a fourth war in a decade. Gaza has been controlled by Hamas for more than a decade, during which time it has fought three wars against Israel, most recently in 2014. Along with Egypt, Israel maintains a blockade that has brought the territory's economy to a state of collapse.